It's been less than a year since Jen Toste paid nearly $2,000 for a goldendoodle puppy she fell in love with at an Animal Kingdom pet store on the Central Coast. Since then, she's spent roughly $10,000 on veterinary appointments, surgeries, and medications for that puppy, which was diagnosed with bilateral hip dysplasia just months after Toste brought it home. Toste, who lives in Arroyo Grande, says Animal Kingdom is to blame because the store's owners have "knowingly" purchased animals from irresponsible breeders for years. Through a civil lawsuit filed in San Luis Obispo County—just one of several legal battles and accusations the store is currently fighting—Toste hopes to receive thousands of dollars in reimbursement for her dog's piling medical bills. 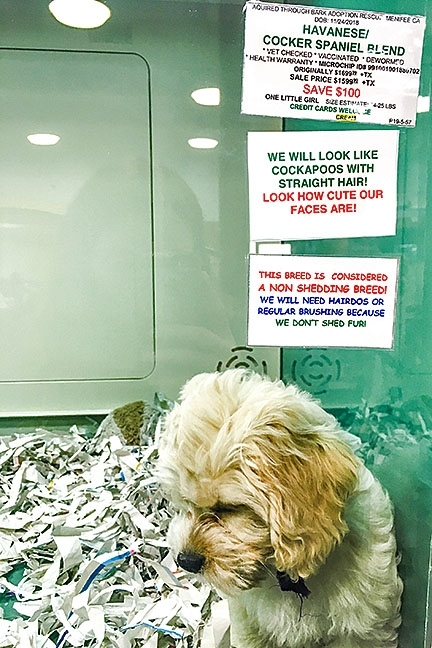 Like many puppies on display at Animal Kingdom’s Santa Maria location, this Havanese/cocker spaniel blend was being sold for more than $1,500 and was acquired from Bark Adoptions Rescue, according to the information posted in the upper right corner of the window. "If Animal Kingdom had any type of ethical component to their business and really a true love for animals, they would have sourced differently," Toste told the Sun. "I understand it's a business, but they have done things the shortcut way to turn dogs around quicker and make money, and I don't know how they sleep at night." Animal Kingdom's owners did not respond to a request for comment. Toste's puppy, Lola, had only been home for about three months when Toste noticed the limping. When Toste took Lola to the vet in October 2018, she discovered that both of Lola's hips were developing incorrectly and that the condition was severe. Toste learned something else, too: Lola's disease could have been prevented entirely. Hip dysplasia is common among larger breeds of dogs, but, as a genetic disease, it can also be easily prevented through responsible breeding, according to the Orthopedic Foundation for Animals, a private nonprofit dedicated to lowering the incidence of genetic diseases in animals. Reputable breeders often screen their potential parent animals for hereditary diseases, such as hip dysplasia. Animals that test positive as carriers for any number of genetic diseases aren't used in the breeding process. Toste blames irresponsible breeding—which can lead to higher rates of disease in animals—for her dog's health issues, and animal rights activists have been fighting to stop it for years. Activists celebrated what they considered a win in that fight in October 2017, when former Gov. Jerry Brown approved a state law requiring pet stores to obtain all dogs, cats, and rabbits from animal shelters or rescue groups, and banning stores from sourcing directly from breeders. It's an effort to decrease the demand for mass-bred animals while increasing demand for the millions of already available shelter animals, which are typically killed if not adopted. 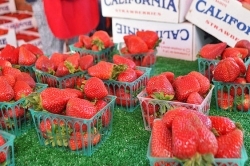 Although that law just went into effect at the beginning of this year, it's already having a significant impact on the Central Coast, though, not necessarily the intended one. Christine Collier, a Vandenberg Village resident and founder of the animal advocacy group No More Pet Store Puppies 805, has long been a vocal opponent of pet stores like Animal Kingdom, which has locations in Santa Maria, Grover Beach, and Pismo Beach. When the law requiring stores to source pets from shelters went into effect on Jan. 1, she noticed that Animal Kingdom was still selling puppies for upwards of $1,500, expensive even for purebred dogs. Then she noticed the store's supposed sourcing shelter, "Bark Adoptions Rescue," which is based in Menifee, California. She looked into it, and found that Bark Adoptions is being investigated for shady operations by animal services departments across California, including San Luis Obispo County. In San Diego, stores that listed Bark Adoptions as a sourcing shelter were fined hundreds of dollars per pet after an investigation concluded that the "shelter" had not received nonprofit status and was likely a front for mass breeders hoping to get their animals into stores. San Luis Obispo County Animal Services found similar issues with the dogs from Bark Adoptions available at Animal Kingdom but Animal Services Manager Eric Anderson said the store was able to provide the county with proof that Bark Adoptions has received 501c3 tax exemption status. There are still "issues" being looked at, but Anderson said, "our determination is that Animal Kingdom is compliant with the letter of the law." Despite those findings, animal rights groups Bailing out Benji and Animal Legal Defense Fund filed a lawsuit against Bark Adoptions and Animal Kingdom on March 5, claiming the organizations are circumventing the new state law by selling commercially purebred puppies that are labeled as rescues. Stores all over California are still selling 8- to 12-week-old purebred or designer puppies for thousands of dollars apiece, according to Mindi Callison, executive director and founder of Bailing out Benji, a nonprofit that works to dismantle puppy mills. Prior to Jan. 1, Callison said many pet stores were sourcing from another "sham rescue" out of Iowa called Hobo K-9 Rescue, until Bailing out Benji published extensive research on the organization that was included in a Chicago Tribune exposé. Then, she said, stores switched to Bark Adoptions, Rescue Pets Iowa, and a few other "questionable rescues." While that lawsuit would likely impact all Animal Kingdom stores, including its location in Santa Maria's Town Center Mall, less is being done in Santa Barbara County to ensure that pet stores are sourcing from legitimate shelters. Stacy Silva, community outreach coordinator for Santa Barbara County Animal Services, said that while her department is aware of alleged issues with Animal Kingdom, there isn't an open investigation into those issues at this time. "We're continuing to actively monitor the store," Silva said. Animal Kingdom's most recent kennel inspection—a process that includes ensuring animals have adequate water, food, space, and documentation—was on Jan. 28, but Silva said she couldn't comment on the findings or conclusion. Silva said that while she thinks the new state law is a step in the right direction, it includes various loopholes that make it difficult to truly enforce the regulations. She's heard of stores doing things like giving away a free rabbit with a rabbit starter kit, which usually includes a cage, food, toys, and other items you'd need to raise a bunny. In that case, Silva said the store isn't technically selling a rabbit—it's selling a rabbit starter kit—so the rabbit doesn't really have to come from a shelter. Animal Kingdom has found a way to get around the spay and neutering requirement, Silva said, and fake shelters are becoming more common, too. She said because stores are no longer required to disclose an animal's original source, just the source the store used to get the animal, "there's no real way" to confirm that those organizations are legitimate. In any case, Silva said the law was originally passed in an effort to promote rescue adoption, and that hasn't happened in Santa Barbara County. Animal Kingdom has not approached the county's shelters to put those available pets in its stores, Silva said. "Their animals are not coming from our shelters," she said. In that way, Silva said the law isn't really achieving its goal. "I think it is a tool and it is a good start, but I think it needs to be strengthened to allow for the enforcement to happen a little bit easier," Silva said. "Ultimately it needs to focus on the backyard breeders as well as the puppy mills where these animals are coming from." Staff Writer Kasey Bubnash can be reached at kbubnash@santamariasun.com.